A few months ago I went into our local book store and saw an interesting cookbook of one of my favorite chefs, Ferran Adriá. It was a book about home cooking, and it is called The Family Meal: Home cooking with Ferran Adriá. Being a lover of good old Caesar Salad, I was glad to find it being the very first recipe in this book! It is deliciously simple and uses no convenience products, but all fresh ingredients. I have adapted it slightly to my process of cooking, but in essence it stays the same. 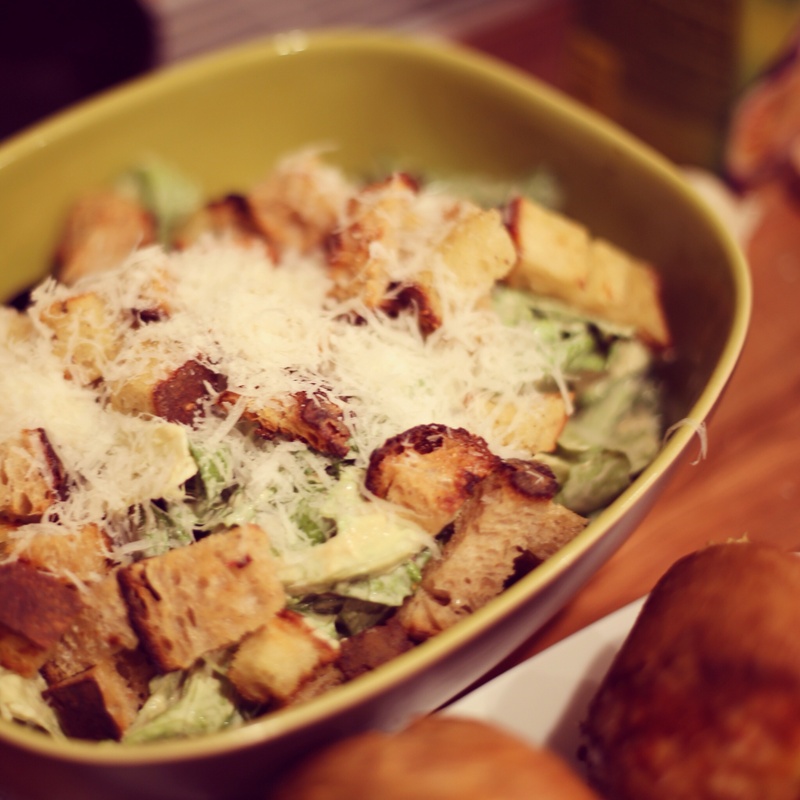 Enjoy cooking Caesar Salad! The basis of this dressing is like doing mayonnaise. Lightly crush the garlic, and together with the anchovy, egg yolk and vinegar mix in a narrow mixing glass with a hand-held blender. Once you get to a creamy consistency, slowly start adding the oil in small portions and wait until fully incorporated. After half of the oil has been incorporated, you can add faster. Blend until a very smooth mayonnaise-like texture has formed. Stir in half a cup finely grated Parmesan cheese – I like to grate mine with a Microplane grater. Wash the lettuce and chop it, then whisk in the dressing and toss until all leaves are covered. Top with croutons and the rest of the Parmesan cheese and serve immediately. Our tip: if the mayonnaise starts breaking, don’t panic. Simply start another mayonnaise with only one egg yolk, and slowly blend in the “broken” mayonnaise. Make sure you do this slowly and always wait until everything is fully smooth before adding more.